Our series of hinges produced under the 1050 reference umbrella is specifically intended for use on doors that are set flush into a frame, either on a cabinet or on equipment such as machine guards or access panels. 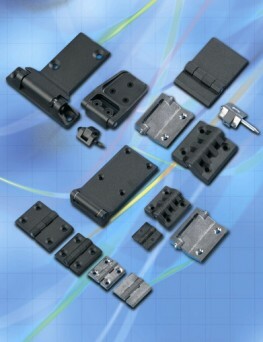 Because they are externally mounted many are designed with a particularly low profile, with concealed pivot pins and are especially suited to outdoor applications. Sub-families such as the 1056 references feature blind stainless steel pins (for increased security) and various fixing methods can be employed, including countersunk screws, concealed studs or integral rivets. Novel removable pin fixing is also a particularly quick and easy method. Hinges of course come in many sizes and selection is dependant upon the door type or size – where large or multiple hinges may be used if needed, e.g. on acoustic canopies, chambers etc. This same 1056 series includes hinges to suit standard aluminium profiles used by major control equipment manufacturers – such as for machine guards. Our design and production engineers are very aware that varying applications often demand different materials and so provide a choice within the 1050 programme. This includes: Zinc diecast – e.g. for use in external applications with stainless steel pin. Available in powder paint or chrome finish. Polyamide – a low cost, low weight material, often used in mildly corrosive conditions. Stainless steel – generally specified in offshore or other difficult environments, e.g. chemical washdown areas, or where strength is a major focus. Naturally it is understood that some situations are less standard than others and so where flush doors require adjustment for fit, then we can offer 1050 hinges with 2 and 3 dimensional adjustment to enable correct fit and gasket sealing to be achieved. Share the post "Hinges for flush doors"